This entry was posted on Sunday, April 19th, 2015 at 4:38 AM and is filed under club del barrio, Milonga, milonga codigos, Tango, tango culture, tango economics, tango music, tango practica. You can follow any responses to this entry through the RSS 2.0 feed. You can leave a response, or trackback from your own site. As always, a fascinating exposition (one which I do not have time at the moment to read in its voluminous entirety). Surely you are aware that in Buenos Aires it is a *very* VERY common practice to “schedule exhibitions during breaks in social dancing”? That doing so promotes attendance at the milongas by the friends of those who are performing who wish to support their friends’ performance? That this serves as a reward for both the performers, whose status is raised, for the milonga organizers, who get a better return on their investment, and for the friends of those who perform, who enjoy the community sense of supporting their friends? While those attending the milonga who are not friends of the performers don’t enjoy the community support advantage of the performer’s friends in attendance, they do benefit from having more people to dance with. This interlocking constellation of incentives for scheduling performances during breaks in social dancing suggests that you are swimming against the Argentine tide when you recommend no performances at milongas. Thanks, as always, for your thoughtful post. In Buenos Aires, exhibitions have been common at Milongas del Barrio such as at La Milonga del Mundo (Sunderland Club), La Baldosa (Salon el Pial), and at the former Glorias Argentinas, at milongas popular with tourists (e.g., Porteño y Bailarin, Confiteria Ideal), and at some milongas popular with young people (e.g., La Viruta, Milonga 10). Exhibitions are rare at Milongas del Centro such as at Lo de Celia, El Beso, Los Consagrados, Obelisco Tango, La Nacional, Nuevo Chique, and El Arranque. At Milongas del Barrio and Milongas del Centro (although not necessarily at tourist populated milongas or young people milongas), exhibitions are not accompanied by tango for exhibition on the social dance floor. In Buenos Aires milongas, the overwhelming majority of dancers know the difference between tango for exhibition and tango for the social dance floor. At First World milongas, exhibitions are commonly given by traveling instructors who have been invited to teach tango in that community. Accompanying the exhibitions are announcements of upcoming tango workshops; thus, the exhibitions serve as advertisement for the instructors’ workshops. In First World tango communities, dancers have varying degrees of familiarity with the customs of the milongas of Buenos Aires. Many dancers do not understand that the conspicuous displays and the movements that do not flow with the line of dance characteristic of tango exhibitions are inappropriate for social dancing at milongas; certainly they are already provided with examples of socially unacceptable dancing by other dancers at milongas. It is best not to further imprint the images of exhibition tango upon the minds of tango social dancers in the First World. Therefore, although tango exhibitions are common at some milongas in Buenos Aires and hosting exhibitions at a milonga would not be a violation of Buenos Aires milonga codes per se, the impact of exhibitions on social dancing at First World milongas makes selecting this option in following Buenos Aires milonga traditions an undesirable choice for many if not most First World milongas because it interferes with the higher goal of limiting exhibition tango on the social dance floor. P.S. It should be noted that not all tango exhibitions at milongas demonstrate tango dancing that is inappropriate for social dancing, although most do. It is also true that there do exist tango dancers in the First World who recognize the distinction between exhibition tango and tango de salon; however, these dancers are in the minority in most First World tango communities. Thanks for your efforts. I much prefer a square floor because, despite the best efforts of tango people like yourself, the selling of choreography as tango results in ignorant people disrupting the ronda, and I pass. It’s a pity, but I judge that to be my best option. I agree, but want to point out that virtually every established milonga in Buenos Aires has a bar that serves whatever the dancers want to drink. That’s how the owner/organizer makes money to keep the place going; water drinkers don’t pay the bills. Recently I noticed that one of my favorite milongueros viejos at Lo de Celia was acting a bit strangely one night and saw a bottle of champagne on his table. There are several who have a whiskey or two during the night. 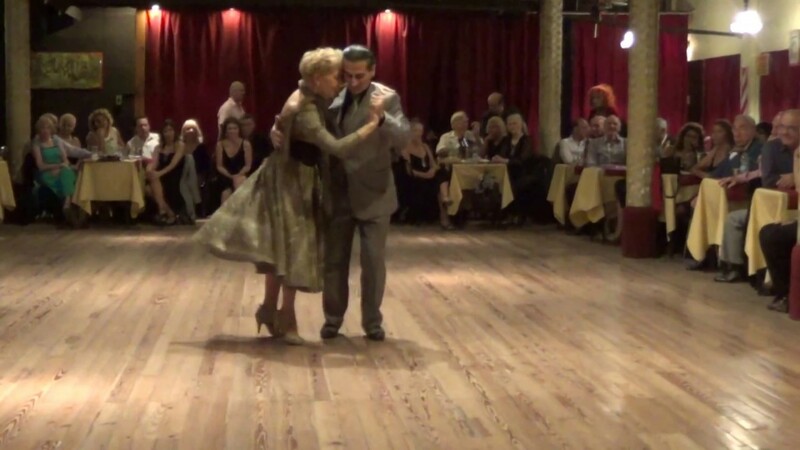 The milonga waiters don’t refuse to serve anyone, no matter how old they are,. Exhibitions breaks are relatively recent. Club Almagro organizers may have been the first in the 1990s to start them. Dancers don’t want to watch someone dance on an empty floor, they want to dance themselves among others. That’s why they go to dance. Today exhibitions promote the couple as performers and/or teachers. Their friends show up to see them, not to dance with the crowd. Exhibitions at the city center milongas (60-85 years) are rare, not regular. Lo de Celia never has one. If organizers listened to their customers, they would discover that the majority aren’t interested in having a 15 minute break to watch one couple perform. If they want to see a performance, they go to a tango show. Cachirulo is the only city center milonga I know that robs dancers of social dance time to let one couple monopolize the floor. El Arranque was closed May 16 for administrative reasons. No one knows if it will be reopened or not. In the meantime, dancers who normally would go on Saturday to El Arranque have migrated to Milonga de Los Consagrados in Centro Region Leonesa. There are complaints about poor navigation. Also Salon Castel where Porteno y Bailarin was held for more than ten years was also closed, possibly by inspectors. The organizer moved to Casa de Galicia, changing his Sunday & Tuesday milongas to Saturday & Wednesday. The point to be made about establishments that serve alcohol as a site for a milonga is that in First World cultures a bar with dancing is still typically an establishment where consumption of alcohol, often to excess, is the primary reason people are there. Dancing is just a means for people to meet each other, maybe not for all people, but the character of the environment is determined by alcohol consumption, not by dancing. Although milongas in Buenos Aires serve alcohol and attendees are there to meet other people, it is the dancing of tango, with all of its traditions, that creates the social environment. At a First World milonga, a host can certainly serve alcohol, but the environment is only shaped by tango if the primary reason people attend is to dance tango. To accomplish this, the milonga environment needs to be distinctly separate from the bar environment, not engulfed by it.